Update 2019: Johnno's is currently open Saturdays and Sundays. 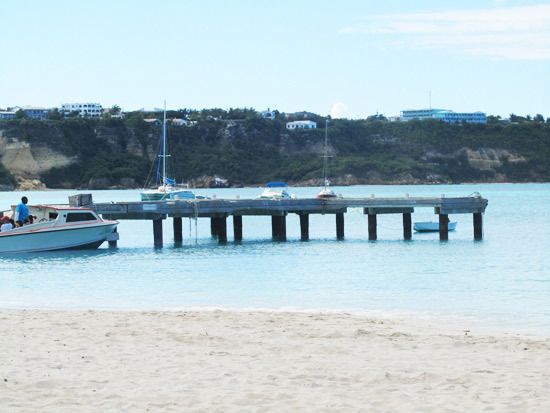 One of the first beachfront establishments in Sandy Ground, Johnno's is loved by many. 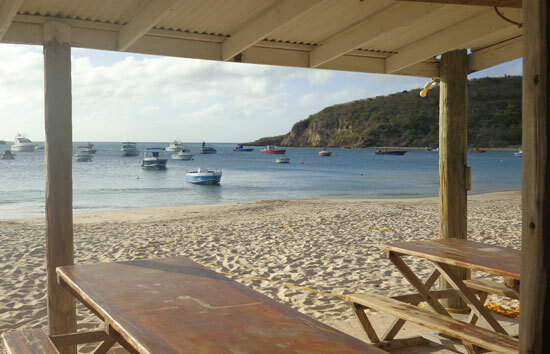 Known for its whole snapper, live music on Sundays and prime location in the heart of Sandy Ground, on the beach, no trip to Anguilla is complete without visiting one of the island's original beach bars. 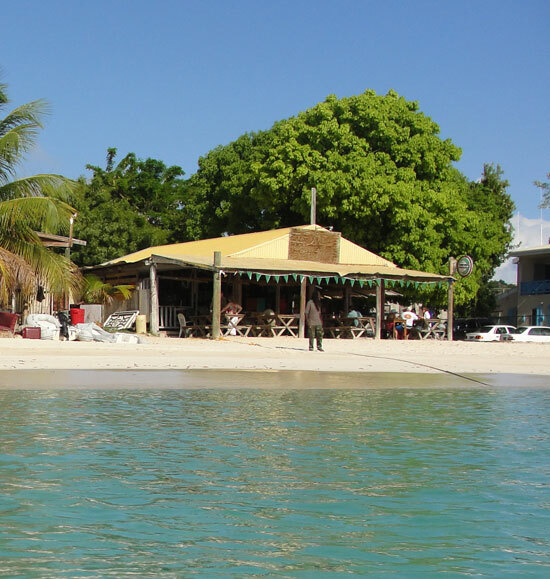 Johnno's is a lunch and dinner restaurant and bar located in Sandy Ground on Anguilla. Best known for its whole fresh snapper and Sunday afternoons filled with live jazz music, Johnno's has had a presence in Sandy Ground since the mid 80's. 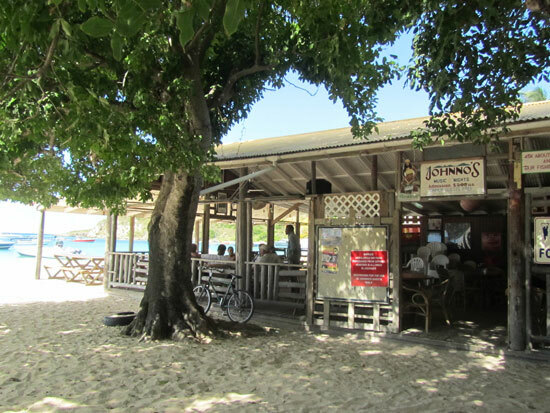 Covered and open-air, it is casual and laid back just as a beachfront Caribbean restaurant should be. I have had several nice afternoons at Johnno's. There are plenty options at Johnno's: hot dogs, hamburgers, chicken sandwiches, ribs, and fried fish are available from the grill. Dishes cooked on order include the steamed fish (which I will soon gush about), lobster, fish fillet, stew conch, shrimp scampi, chicken, and either a stripling or t-bone steak. The above items are not listed as a la carte, they come with accompaniments ranging from cole slaw, salad, rice and peas, fungi, and french fries. The grill items price ranges from $9 to $24 US. On order entrees range from $20 to $32 per pound US (for the lobster). Johnno's has good cold beverages as well. If you're not in the mood for a soft drink or beer, try some of their frozen drinks… the Johnno's Special is a good one to start out with. I've seen children with eye-pleasing non-alcoholic frozen drinks and smoothies too. Having eaten everything from a fish sandwich, ribs, cheeseburger, and marinated conch salad, I must say that the whole steamed snapper has been my favorite. It's not surprising that this entree is the menu item that Johnno's is best known for. First, it is fresh. It is right out of the sea, caught by a local fisherman. Secondly, it is cooked perfectly, full of flavor, and just feels like you are eating the way you are meant to eat when you indulge on this famous Johnno's entree. Have it with fungi, have it with fries, have it with rice and peas, whatever you please, but it will still be all about the fish. I realize plenty reading this are likely not fans of eating whole fish. Understand that I used to be one of those people and fortunately was brought a whole fish by mistake once (but not at Johnno's) which was when I opened my mind and tried it instead of sending it back. I saw the light and now appreciate the process of eating and enjoying a whole fish. Watching people who are very skilled with a whole fish makes it look almost like an art form. I share this to encourage those who may be the types who want to get the most of an experience and have no regrets. If you find yourself at Johnno's and want to try the whole fish but aren't sure about how to tackle it, don't be shy to ask someone. You'll find many of the locals that hang around Johnno's would be happy to give a few pointers on the topic - this is just how lovely many Anguillians are. Likewise many patrons are nice people and a server can always stop and assist. Over the years Johnno's is the venue for many live music events during the day and for late night. 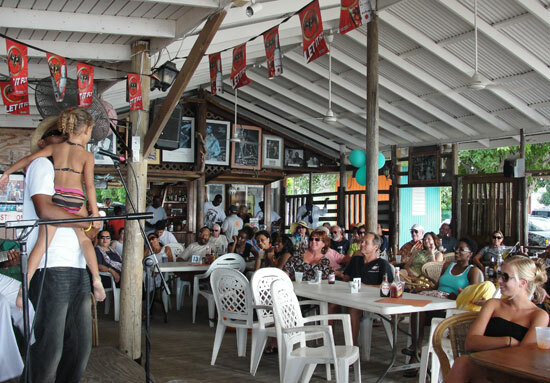 The late night live music events tend to be local bands and are attended mostly by locals, however visitors are welcome at almost any type of event in Anguilla. 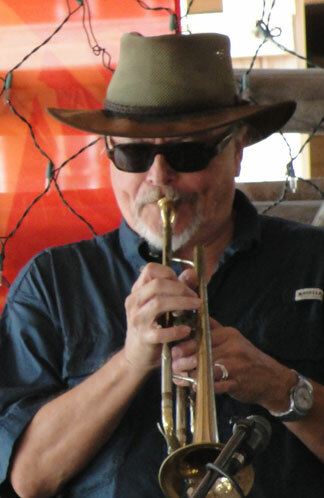 The standard, consistent over the years (with exception to several weeks in the slowest months of September and October), is the live Sunday Jazz at Johnno's from 1pm to 4pm. While jazz is the key genre of the day, some other more "jazzy" and mainstream tunes make their way in to the set as the band will take requests. Names and faces that have graced Anguilla over the years with their musical talent are on hand to entertain, including Sprocka. 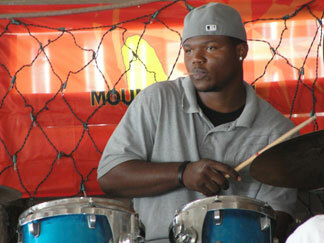 Sprocka is an Anguillian multi-talented musician on the guitar, keyboard, saxophone and trumpet. 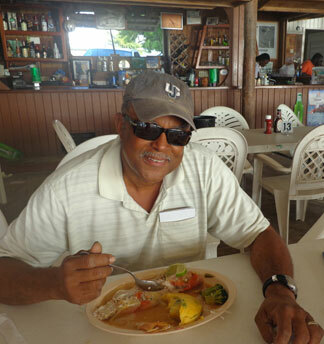 His smooth voice has been keeping Anguilla entertained for many years and he able to fulfill almost any request. There are a few regular musicians on drums, bass and brass as well. These musicians are talented and are very willing and able to allow for impromptu guest musicians to make their way to the stage if they are inclined. I recall one of the award-winning Mary J. Blige's back-up singers who was vacationing in Anguilla got up to sing a few songs in 2012 and she was amazing. You never know who might be around and ready to jam. When you do get to Johnno's... relax, unwind, enjoy, try the steamed whole fish, groove to the music, and know that you are experiencing a beloved small piece of Sandy Ground establishment history. 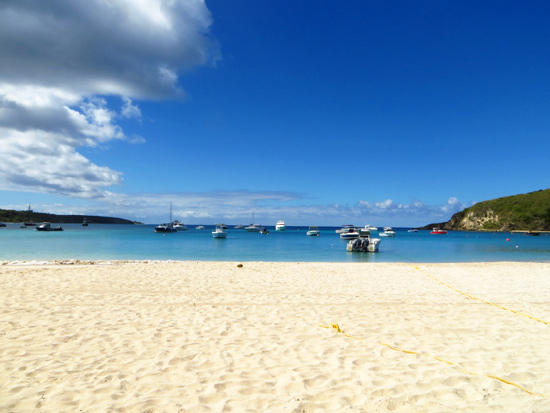 Johnno's is a first choice spot for family beach days. 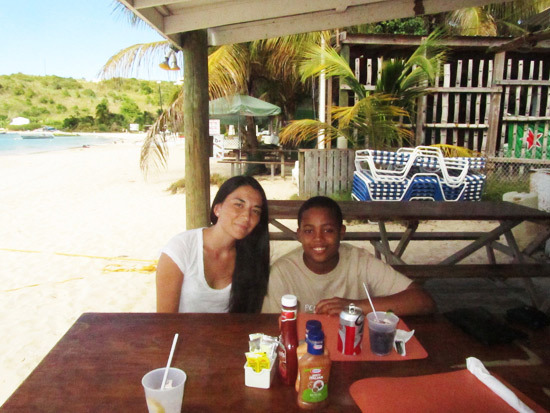 Kyiv Edwards, an Anguilla-Beaches.com intern, and I (Nori) had lunch at Johnno's one afternoon. 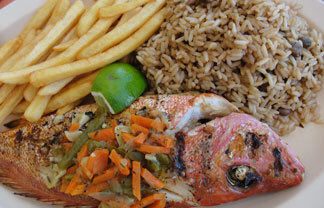 Johnno's has a wide variety of Anguilla's finest cuisine on their menu. You want to have a real Caribbean dish served with their peas & rice and fish served with vegetables and ground provision (potatoes, fig and dasheen). For my Mom and Dad, they always choose the whole snapper with plaintain. 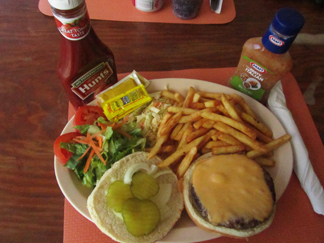 If you don't feel too adventurous, then just have a cheeseburger with fries. I love everything on their menu, it's hard to choose just one dish. 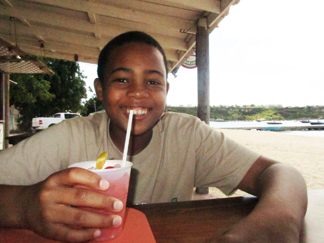 Johnno's drinks are guaranteed to quench any parched lip or dry throat. From daiquiris to fruit punch, we love them all. After eating, I enjoy jumping off the wharf with my sister and swimming under it with my little brother. While Mom and Dad chat or kick back in a beach chair, my siblings and I splash in the water, having a grand time. Many people love this spot for the local community feel, cool water and soft sand. 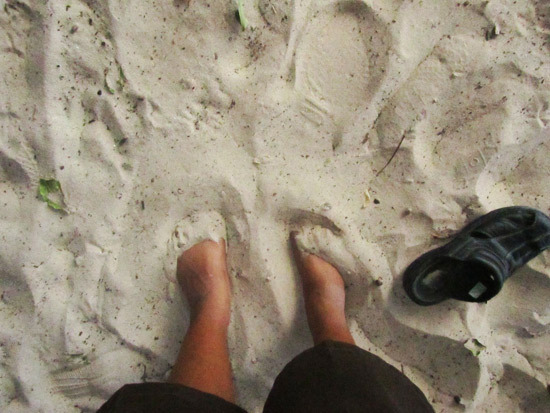 The second your feet touch the warm sand, your senses are heightened. Besides the delicious food at Johnno's and the beach, my parents' favorite thing is their live jazz music on Sundays. Enjoying good food, sitting down with family, enjoying the view and allowing the music to lift your stress and comfort you, that's what my parents love about Johnno's. Directions: Located on the beach in Sandy Ground, right next to the wharf. Good for laid-back beach afternoons and live jazz music on Sundays. Hours: Lunch and dinner. Closed Mondays.